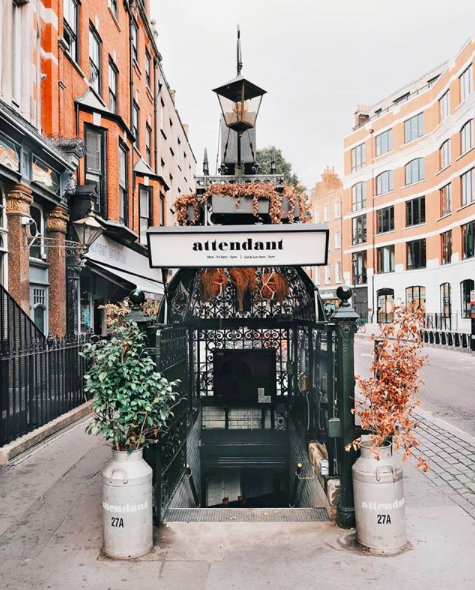 Located in the heart of Fitzrovia and a stone’s throw from the hustle and bustle of Oxford Street, this quirky establishment transports you to a secluded underground alcove. It is a coffee shop in a former Victorian toilet. On the outside, this brunch and light lunch café introduces itself with an umbrella like canopy adorned with twisted, blooming flowers. As you descend the stairs, the waft of coffee rises to greet your nostrils and envelopes you in a warm and inviting embrace. Once inside, there are only enough seats for about ten to twelve customers max, but this just adds to The Attendant’s charm; rather than fighting to be heard over a crowded restaurant, there is something deliciously intimate about speaking in lower tones and having a good ole gossip over a cup of steaming tea or coffee. 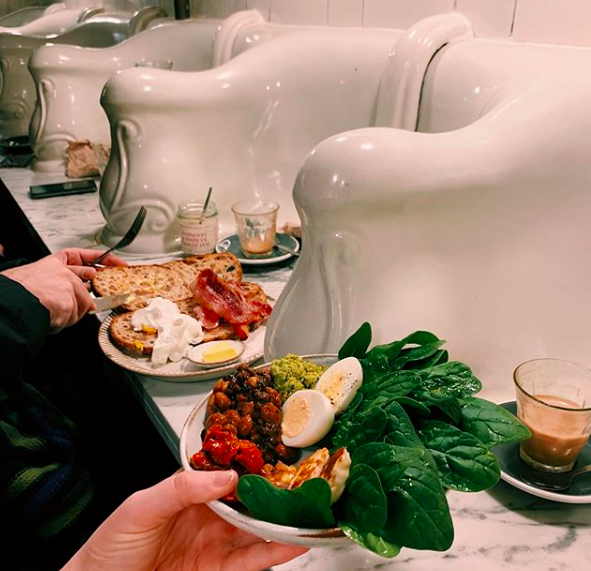 The interior space has been creatively transformed to bring remnants of the venue’s past into the present: urinals (fully sanitised I can assure you) adorn one wall and are intersected with marbleised tables to create individual booths. Far from being distasteful, the décor screams fun! The jazzy tiled floor begs to be walked over and tiled walls alongside wooden tables and cushioned chairs, create the illusion of a hybrid bathroom and dining room rolled into one. It really is unlike any place I have stumbled upon before! What’s better, as you leave, there is a wall where customers can leave their mark by writing their name or a message, to mimic the graffiti that so often sprawls across modern day public toilets! The Attendant boasts of its own seasonal espresso blend, and also offers guests a variety of hot and cold drinks from cold press juices to Wellness drinks. I’ve opted for the ‘Strawberry Zest’ in the past- which was refreshingly sweet with a delightfully smooth texture. With names such as ‘Immunity’, ‘Berry Recovery’ and ‘Super Greens’, The Attendant’s smoothies are further guaranteed to kick start your immune system and provide you with unlimited yummy goodness! The food menu, despite a small number of options to choose from, covers a broad range from bacon rolls, house-made sandwiches, seasonal soup and the ‘House Waffle’! 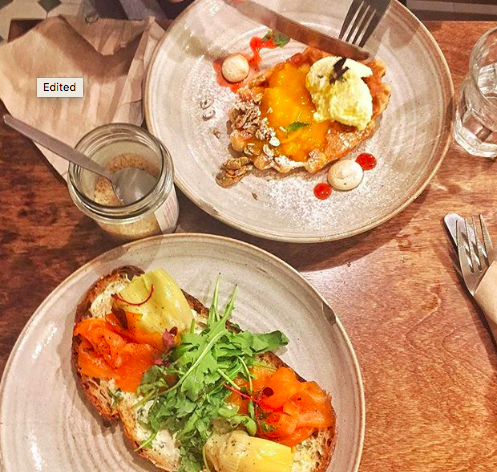 I have sampled the ‘Maldon Smoked Salmon’ – a heavenly concoction of seeded multigrain toast with lemon and black pepper cream cheese, grilled artichokes and generous rolls of fresh smoked salmon. I certainly wasn’t disappointed! Each bite revealed new tastes and textures, all of which created an explosive and flavoursome party in my mouth! The Attendant is open everyday of the week as a testament to its dedication to serve people with local, fresh, and produce-driven seasonal food, that is sustainable and ethically sourced. You are what you eat and The Attendant is aware of this, striving to make their customers conscious of the environment and the food that they are putting in their mouths and where it has come from. The Attendant is the perfect pit stop to refuel during study sessions, your lunch break, or a day browsing the shops! Make sure to check it out and write your favourite foodie gem in the comments section below! Nearest Tube Station: Oxford Street (5 min walk from there).